It’s not wrong to call it epic. The critical tempest surrounding the film John Carter was on a scale dwarfing martian sandstorms. The vitriol gushed forth in the spring of 2012, as if Edgar Rice Burroughs, Taylor Kitsch, Andrew Stanton, Mars, and Disney, especially Disney, had offended everyone by trying to make a movie together. Critics descended on this one with a predatory savagery like vultures on a dying infant. Before I take a crack at it myself, allow me to remind you of just what the professionals had to say about John Carter of Mars. John Carter was originally titled John Carter of Mars. It is based on Edgar Rice Burroughs’ first John Carter story, entitled A Princess of Mars. The Princess was removed from the title because it would confuse you, the moviegoer, into thinking the film was about a princess. Mars was removed from the title because Disney’s previous Mars movie (Mars Needs Moms) allegedly lost $140 million for the studio. The word “Mars,” like idiosyncratic punctuation, is not good box office juju. Without princess or Mars to hold him down, John Carter came to us unadorned, save for the heavy price tag swinging from his neck. $250 million went into the making of the film, with $100 million more apportioned for marketing. After the film premiered, and critics and audiences had their say, it was estimated to lose $200 million for the studio (though the number is said to have shrank since heading to international markets and home video). On the bright side, however, the state of Utah, where much of John Carter was filmed, received a nearly $20 million boost to their economy for all the jobs it created. There are silver linings to every crimson cloud. So with all that out of the way, the question arises, the question that lingers over every flop in cinematic history, the haunting interrogative that must needs be answered by humble reviews such as this: Is it really that bad? You know the answer. The answer is no, because nothing can be. John Carter lost a lot of money and tried to save a very clumsy script with a lot of money, and a lot of money was wasted trying to sell a film that the word “Mars” on a movie poster could have done, but John Carter is really a very average movie that tried very hard to live up to one hundred years of expectation. A Princess of Mars was written in 1912. Burroughs was so ashamed of being connected to it that he used a pen name when it was published. It was pulp, sure, but the hardiest kind. Giovanni Schiaparelli had discovered what he believed were canals on Mars in the late nineteenth century, and the idea that the red planet was once inhabited, that it might still contain life, other civilizations, was a science fiction bonanza. John Carter was never the cultural mainstay that Tarzan, Burroughs’ later creation, came to be, but he inspired every generation thereafter. Flash Gordon and of course Star Wars owe Carter a great debt, but it is the revolving nature of Hollywood that these films, arriving long after their inspiration, became cited as the very works the John Carter film was too derivative of. And had John Carter not concerned itself with matching the onscreen spectacle of its descendants, it would have fared much better. There is a great well of stories Burroughs left us to draw from, and at every turn John Carter attempts to dredge as much as possible. There is never any time to develop the massive world we’re suddenly given, and even at over two hours, we must learn too much, too quickly. And it is a shame, because there is some genuine good inside this muchness. Here we go: John Carter (Taylor Kitsch), a former Confederate Captain during the Civil War, returns from the war a broken man, unwilling to fight for any cause or anyone. He finds his home burnt down, his wife and daughter dead, and all meaning to life extinguished. He turns to prospecting, hoping to earn enough gold to buy the isolation from humanity he cannot find in life. The U.S. government tracks him down to Arizona in hopes of re-enlisting him. He escapes to a cavern where he finds not only gold but a strange glyph and a stranger man. After a brief fight, the man’s medallion transports Carter to Mars, where the density of his Earth-born bones and muscles gives him incredible strength and stamina, allowing him to leap wide canyons in a single bound. He is enslaved to the Tharks, large four-armed green-skinned warriors, and then embroiled in a war between red men, two human cultures that fight for supremacy of the dying planet. Unbeknownst to them, another faction is manipulating events on all sides. The enigmatic Therns wield the power of the ninth ray, a limitless energy source, feeding off of conflict and willing to destroy any man or race that gets in their way. John Carter, a man who once thought his war was behind him, must battle the creatures of Mars as well as his own heart, as he falls in love with the beautiful and passionate princess of Mars, Dejah Thoris, who believes he has the power to end the war. If you’ve managed to make it through all that without skipping, you may notice that the story starts in a place we can understand, and gradually stumbles its way upward into a sprawl. 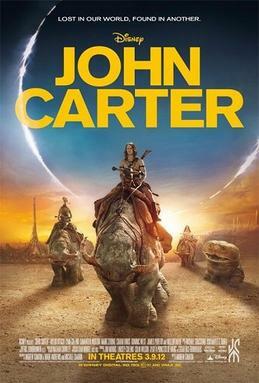 John Carter’s first problem is that it simply has too much it wants to deal with in just one movie. I have tried, in the summary above, to give you the basic chronological narrative. The film, however, starts somewhere in Mars’ recent history, when the leader of Zadonga receives the power of the ninth ray from the Therns. The scenes of Martian air battles are beautiful, but too animated, too bombastic. Director Andrew Stanton seems to be modeling his film’s introduction on A New Hope (1977), but there we were given a gradual understanding of who runs the Empire and what the rebels stand for. When we first meet Sab Than (Dominic West), we learn that he is evil only because the voice over tells us so. And other than that, Sab Than is rarely in the film, and rarely shown doing anything more evil than defending himself. So. Then we jump to Earth, in 1881. First we see John Carter send a telegram to his nephew, Edgar Rice Burroughs, and then we learn, when the nephew arrives, that his rich uncle is dead. Okay. Edgar is given John Carter’s journal, which he begins to read, and we jump to 1868, when Carter is approached by Colonel Powell (Bryan Cranston), who wants him to join his cavalry to kill Indians. After repeated escape attempts, a confrontation with Apaches, and finding a cave of gold and a Thern with a medallion, Carter is teleported to Mars. Let’s review. The film, in its first twenty minutes or so, takes us from some time in Mars’ past, to 1881 America, to 1868 America, and then to Mars again, some time after our initial introduction. Why play this game of hopscotch when starting us in Carter’s cave would have sufficed? The film’s second flaw is its main conflict. John Carter is really a man versus self story, with the titular character a believer in nobody’s cause and lost and lonely on both Earth and Mars. The war between Zadonga and Helium, the cities of the red men, as depicted, is nothing more than a battle for territory. Apparently Helium wants peace and Zadonga wants the opposite, but the two sides are never shown doing more than fighting each other, so the only thing Helium has going for it is Princess Dejah Thoris. And she’s almost enough, actually. Dejah Thoris is played by Lynn Collins, who is so beautiful in this movie she makes the special effects look like cardboard cutouts. But that is no surprise. An attractive princess is a major selling point in this big, strange world, yet if Collins was merely eye candy she would disappear into the animation; instead, Collins is a capable and passionate actress, and her wonder, her boldness, her self-consciousness, these emotions define her character. She and Taylor Kitsch carry the bulk of the film and the script does them no favors; thankfully, however, their chemistry and acting prowess take them far beyond it. Making the princess a professor as well as a warrior may seem like a stretch, but Collins sells it, and there are far too few strong heroines in movies of this size for me to complain. As long as we’re talking positives for a moment, Taylor Kitsch deserves special mention. Critiques of the film were not kind to the young man and frankly he’s what keeps it from turning into an unsalvageable mess. The character of John Carter is coming from a very dark place, as near to suicidal as a man can be. Yet Carter doesn’t care enough about life to take his own, so he’d rather just be alone. Kitsch plays Carter with a hard edge and a very wry humor, and it grounds his otherworldly encounters. So many minor missteps were taken approaching this film, but its leads were chosen perfectly. And this is the ultimate misstep. When Kitsch and Collins are onscreen together, Carter and the princess are real enough. Collins’ enthusiasm and Kitsch’s depression keep their characters burning for each other, but once we leave them, to watch the Therns plot (for reasons we’re never clear on), or Sab Than march down a CGI gangway, or the Tharks brutalize each other, we lose the human element that this science fiction so desperately needs. The music is often garishly out of place. It doesn’t follow the action or emotional beats at all, seems to come piped from another movie. The sound cues, too, do not line up. When so much of a film is artificial those tactile sensations are necessary. Two perfect examples: During what could have been a highly emotional moment, Carter makes a last stand against an army of Tharks, and while he fights them the scene intercuts with him finding his dead wife and daughter and burying their bodies. It should be devastating. The music seems to sort of understand, and Kitsch in both scenes, burying and slaying, is clearly giving his all. But there is no sound. There is, occasionally, the sound of the shovel. If the sound of the shovel was akin to the sound of his swords, or if we heard the swords slicing, or if we heard the Tharks he was fighting screaming, or him screaming, either after burying his family or while indiscriminately killing these creatures, that would give us something. But instead there is a little sound and a lot of bombastic orchestra, and it robs us of what we need to hear. The other example is Zadonga, which is a massive city on legs. What sound do you hear when you picture gigantic legs marching over the desert? Whatever you think it ought to sound like, Stanton didn’t hear it. The legs don’t make a single sound when John Carter is inside the city. The silence is deafening. Details like this, not how many CG creatures you can fit into a scene, are what fool us into thinking this make-believe has weight. Ultimately, John Carter’s failure is one of immersion. Critics complained that the thing was too long because it didn’t seem to take us anywhere and we are never invested enough to follow where we do go. Andrew Stanton filmed using three cameras simultaneously to maximize his potential angles. Peter Jackson is a director that makes great use of multiple camera angles. He does it in a way that makes his films seem even larger, but he does not break our focus. Stanton, perhaps because his background is in animation, never seems to get the pacing of his live shots right. Funny moments are stilted, dramatic ones are confused. We never linger on any shot for too long, and our eyes are constantly batted around the rooms or vistas or flying ships we’re supposed to be watching. Performances, with few exceptions, are great in this movie. There are a lot of Martian phrases and terminology to bark out convincingly, and everyone* manages. Its lead actor may be a pretty boy, but he’s the strong, wounded hero this story needs. Our princess is sly and stunning. The worlds are imperfect and realistic: Carter is a former Confederate and his country is still trying to kill Indians and each other; Mars’ cultures are composed of killers and hypocrites. There is an enemy, something older, larger, and darker preying on the galaxy, unrealized in this film but hinted at as the real antagonist to be revealed in future sequels. But will these sequels ever be realized? I doubt it. John Carter was not given a sporting chance; though I’m not sure by who (maybe the Therns). Its shortcomings are no worse than the typical Hollywood dud, and its good moments are much better than. Burroughs left us so much and the filmmakers wanted to give us simply everything. And the critics cannot be critical of the obscene amount of money spent. Without this business of show business they would be out of jobs. There are much louder, much dumber movies out there to spank. Compared to Avatar, John Carter is more daring, more original, and more mature. Then again, James Cameron is a veteran action director, and Stanton is not the man that raised the Titanic. But one has to wonder what this film would have looked like if it were made for half the price. Would they have tried to do more with practical effects? Would they have limited our antagonists, kept us in one Martian city, eliminated the pointless frame story and told a more linear tale, from the Civil War to Mars? Like Darth Vader, there is still good in this picture. I can feel it. The scenes of discovery, the romance between veteran and princess, the comradery between man and Thark, the blue Earth and the barren Mars – yes. The toothless villain, the puzzling and plotless Therns, the wack-a-mole editing – no. Did it deserve slings and arrows for abusing its outrageous fortune? Only Isis knows. *Being a huge Rome fan, I was pleased to see Nicholas Woodeson cameo as Carter’s lawyer, but then Ciarán Hinds showed up as the Jeddak of Helium with James Purefoy as his chief lieutenant and I thought the casting director was just messing with me. I was distracted the entire movie waiting for more Romans to show up, and then a quick IMDB skim revealed that Polly Walker played Sarkoja. Thanks for blowing my mind, Disney.